Home / QuiBidder of the Week – Connie E.
Congratulations to our newest QuiBidder of the Week, Connie! 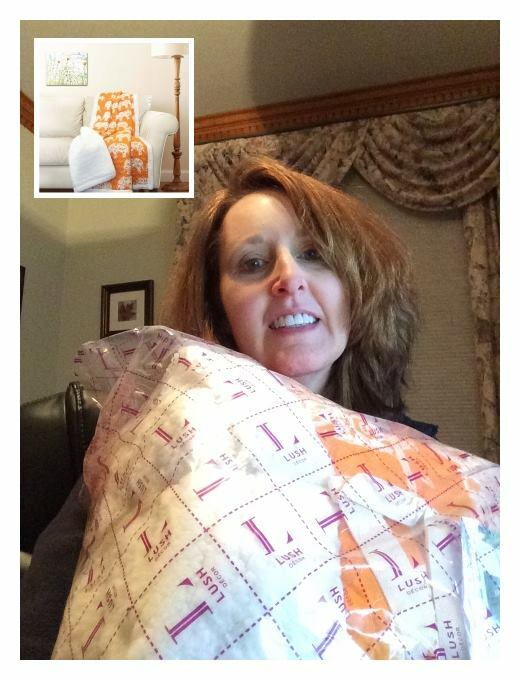 Connie is always sharing the outstanding deals she’s been winning on QuiBids, along with very thoughtful and helpful reviews for each item. 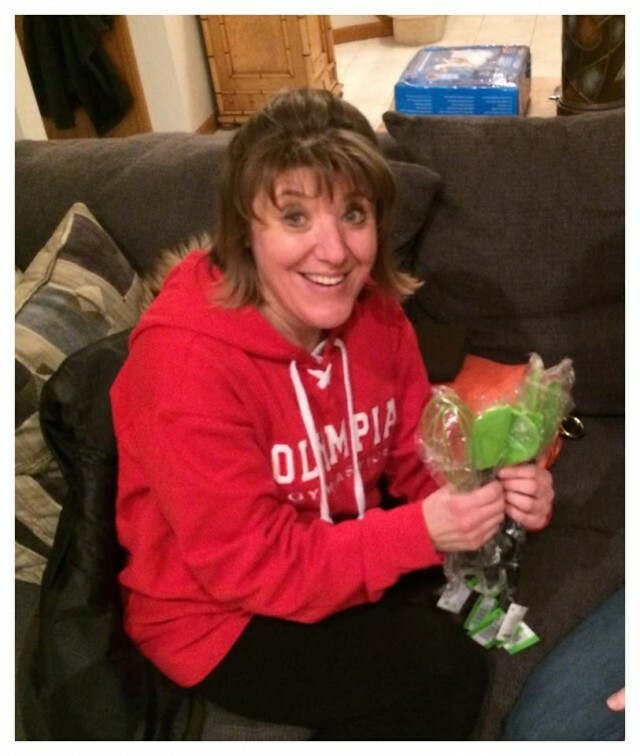 She has been such a wonderful, positive member of our community, that we are honored to award her with the 90 free bids for being named this week’s QoW. Keep reading to learn more about her experiences bidding on QuiBids. If you’re not going to read all of her posts, make sure to at least read the last two at the bottom of this page. She talks about how she used her wins to help a friend get through a hard time. We love hearing about selfless acts of kindness from QuiBidders like this. We’d be hard pressed to find another online community with kinder hearts and more selfless souls than ours. Way to go Connie! “PATIENCE PAYS OFF: One thing I have always known about QuiBids is that good wins are always available. Some just take more time and more patience than others. Like most bidders, sometimes I have the patience, sometimes not. This time, I did. I have wanted this Cuisinart Enameled Cast Iron Roasting / Lasagna Pan since I first saw it about a year ago. I always nibbled at the edges, placing a bid or two (or three or five) on the pan now and then but never really going after it. There was always something else I really wanted my bids for (or some bidder who jumped in that I really wanted to avoid – LOL). This time, patience and staying with it paid off. I bid early (.24 first bid) and then only when I thought the auction might end. Finally, I put on my BOM and said to myself, “This is it!” I won this awesome pan for $5.17 and I used 39 VB doing it. That’s a savings of $59.82 or 92%…a really good win. This is one SERIOUS pan. It is cast iron so, beware, it is H E A V Y! But, nothing cooks better than cast iron in my book. I chose the Red color since I’m going mostly red with all my new items. It’s a winner! 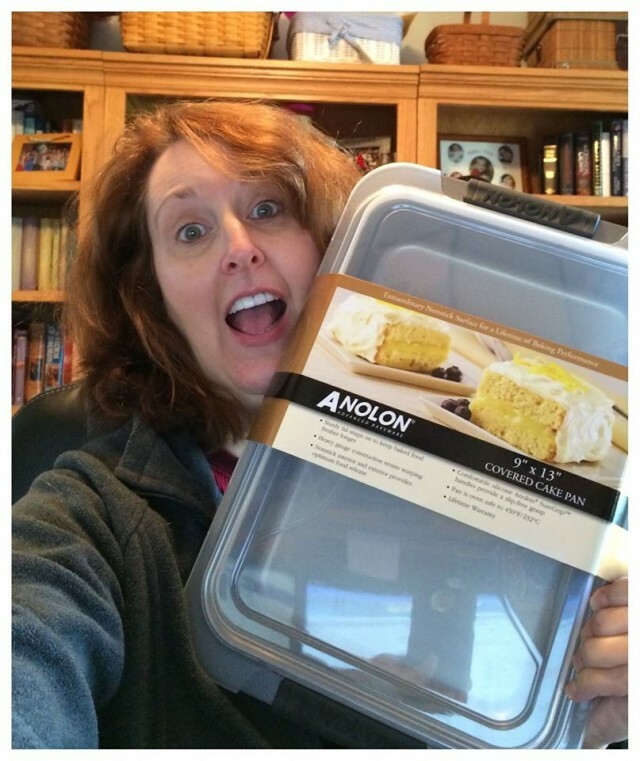 Thanks, Q!” – Connie E.
“REAL EXCITEMENT when I won the auction for this Anolon Advanced Nonstick Bakeware Covered Cake Pan With Silicone Grips (9 -Inch X 13 -Inch) + 1X Gameplay. No more foil or plastic wrap for me. Finally, I have a covered cake pan to transport cakes, cookies, etc to gatherings with family and friends. And not just any old cheap covered cake pan. This one is Anolon which is one of my favorite brands. This one has a sturdy snap on lid. According to the package, it’s heavy gauge resists warping which, if you’ve ever had one of these in another brand, you know is common. It also has a non-stick interior AND exterior for easy clean up. Add to that the comfortable silicone, non-slip handles and what’s not to like? It’s also oven safe to 450 degrees. I used 25 VB and paid $1.54. I saved $42.45 or 96%. And it came with a GP which will even allow me to recoup my bids. 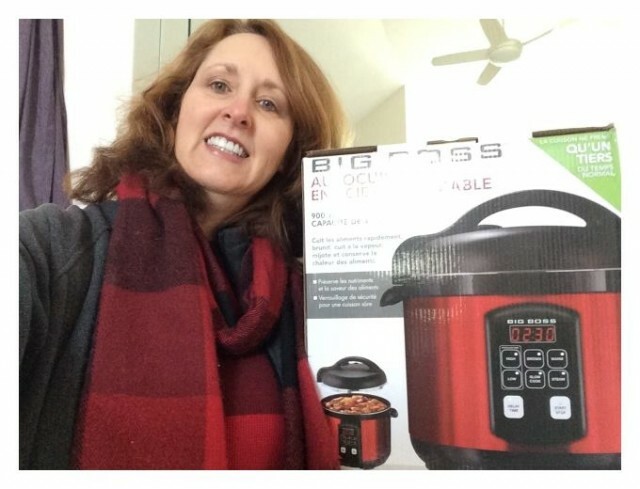 Thanks, Q for the fun and the opportunity to get this great pan for so little.” – Connie E.
“GREAT GIFTING: This is how I like to do my Christmas shopping. 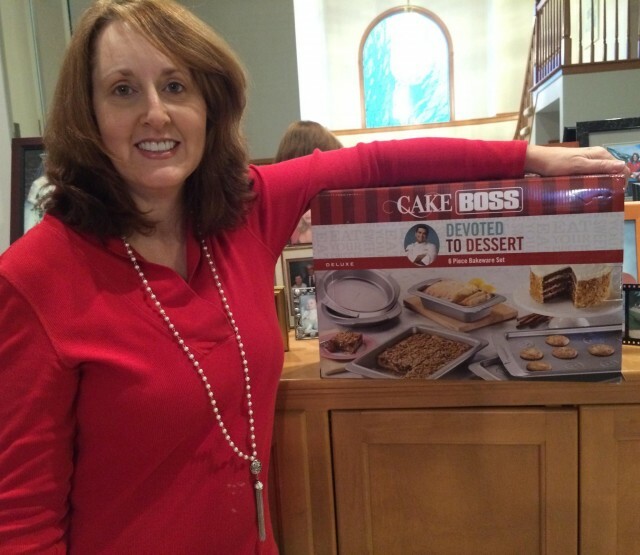 I won this Cake Boss Deluxe 6-Piece Non-Stick Bakeware Set using 3 vb and paying just $2.20. This is a savings of $67.79 or 97%. It is a great set that includes: 2 cookie pans, 2 round cake pans, 1 loaf pan and 1 rectangular cake pan. It’s a perfect starter set for any kitchen because it has the most used sizes. And Cake Boss offers great quality. Thanks for the savings, QuiBids! 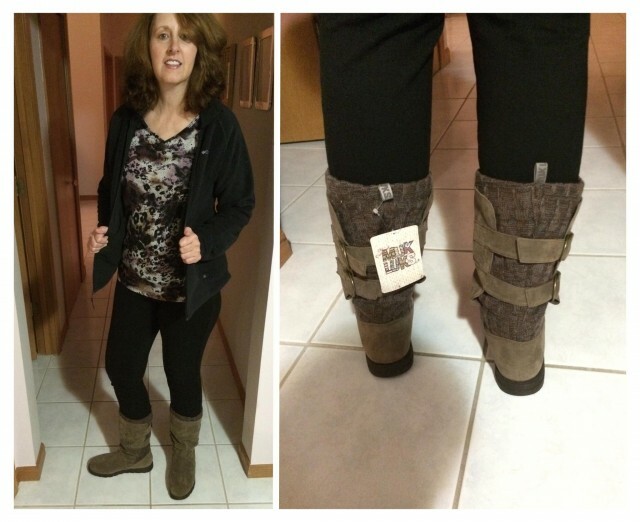 grin emoticon” – Connie E.
“BOOT LOVE: I won this pair of MUK LUKS ® Women’s Luna Boot’s in dark beige ($50.99) for $1.28 using 20 vb, a savings of 97% ($49.71). I researched the boots thoroughly before I chose them, as I normally do all my purchases. The boots only come in whole sizes. MUK LUKS recommends that, if you are a true half size, you purchase the smaller size. However, people that reviewed the boots on other sites, suggested the exact opposite…reviewers said that if you are a half size, you should go with the larger size. I decided to listen to the folks who purchased the boots and who were wearing them. They said go larger and I’m glad I did. The boots would not have fit me if I had gone with the smaller size. They are very snug when pulling them on, but fit perfectly once on. Additionally, the description says that they are water resistant, but, like all my boots, I plan to Scotch Guard them anyway. They are very, very cute too. 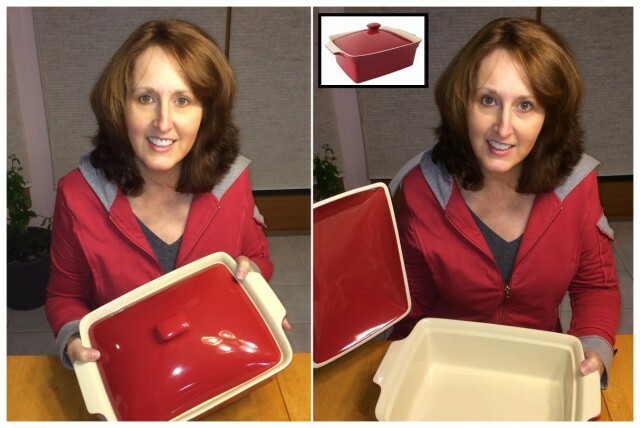 I would advise anyone to research their purchase before buying…shoes especially.” – Connie E.
“The Best of BergHOFF: I really like the BergHOFF products so choosing this Berghoff International Geminis Rectangular Covered Baking Dish was a no-brainer. I won it using 12 vb and paying just 46 cents. This is a savings of $52.53 or 99%. It is a great size and is deeper than I imagined. This will be great when having family and friends over. 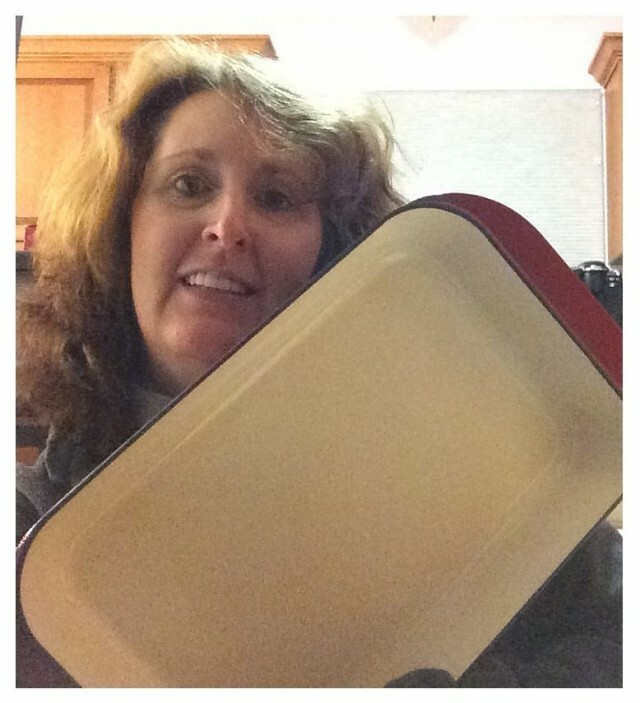 It is stoneware and is dishwasher safe, microwave safe, and oven safe. 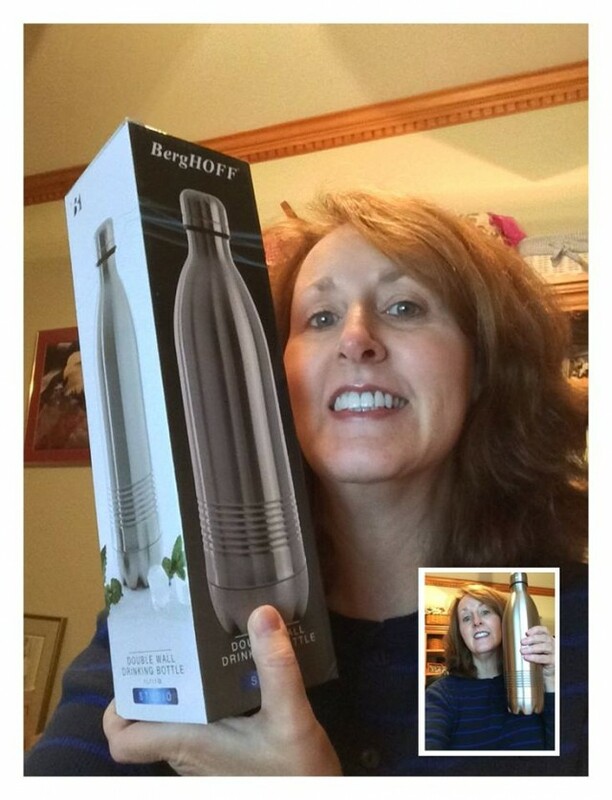 Lots of possibilities for this one.” – Connie E.
“Travel Time: I won this BergHOFF Studio Double Wall Drink Bottle 1000mL (plus a 1X Gameplay) using 30 vb, 4 real bids, and paying $3.38. This is a savings of $44.21 or 88%. I had already gotten one of the smaller ones (500mL) for my son but wanted the larger one for myself for when I travel. I don’t like filling the landfill with plastic bottles so I filter my water at home. I can fill this baby up before I travel by car, and I can take it with me. It keeps my water cold for 24 hours or more. I like that it has a screw cap so I don’t have to keep it in my cup holder to make sure it doesn’t leak. 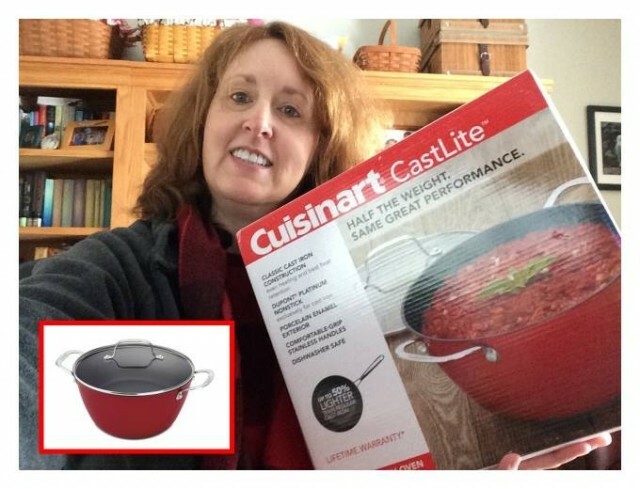 I can seal it and put it anywhere and it will do just fine.” – Connie E.
“CALL ME HAPPY: I was very excited about this win of a Cuisinart 5.25 Quart Dutch Oven plus a 1X Gameplay. But who wouldn’t be? I spent 24 VB and paid $4.25 saving $66.74 or 94%. I love that it is CastLite which means it is cast iron construction so I get even heating and great heat retention but it’s not quite as heavy as traditional cast iron. Not to say that it’s light (no cast iron is), but it’s not nearly as heavy as my traditional cast iron dutch oven. I love the red porcelain enamel. It’s absolutely beautiful. I also had the option of blue but since I’m taking my kitchen mostly red, I was happy it came in that color. It also has the platinum non-stick interior so that’s a great feature, too. This beauty is going to get a LOT of use. Thanks, QuiBids for the opportunity to have a great time and save at the same time.” – Connie E.
“CUTTING UP AT QUIBIDS: This was a great auction win for me. I was so excited when I won it. 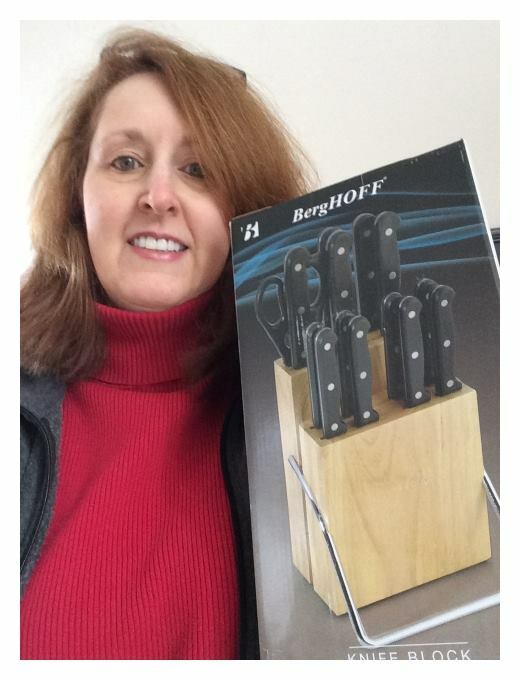 I got this BergHOFF 15pc Lagos Knife Set with Block (valued at $89.99) using just 9 bids and paying just 52 cents. That’s a savings of $89.47 or 99%. I wanted this for a gift. It’s exactly what the recipient needs and it’s BergHOFF. I have been extremely pleased with my BergHOFF purchases. They are one of my go-to brands to shop for. I hope my giftee enjoys it as much as I did winning it for them. 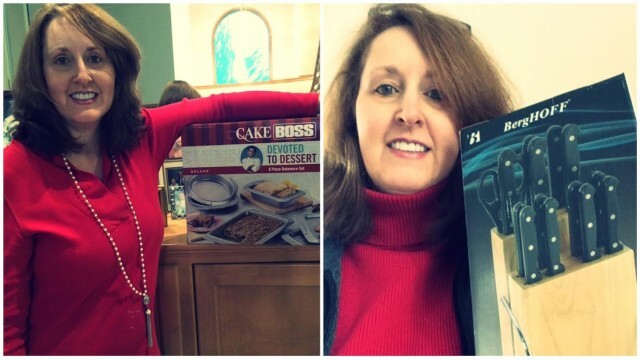 What a fun and economical way to shop for gifts.” – Connie E.
“WIN, SWEET WIN! Every now and then you get one of those wins that you just gotta say, “OH YEAH!! !” This is one of those wins! I got this Big Boss 5 Quart Stainless Steel Electric Pressure Cooker using 6 voucher bids and paying just 34 cents. That’s a savings of $99.65 or 99%. My niece, Emily, got me thinking about and wanting one of these. And there are times when I need to cook a lot faster than a slow cooker or even the oven. My niece uses her pressure cooker quite a bit. I finally decided to try one for myself. I’ll have to give y’all results later, but I’m excited this one is here. If anyone knows of some great Pressure Cooker recipes, please send them (or links to them) my way. (And Denise, I just love red…that’s why I’m matchy-matchy again. Plus, it’s cold in my living room. 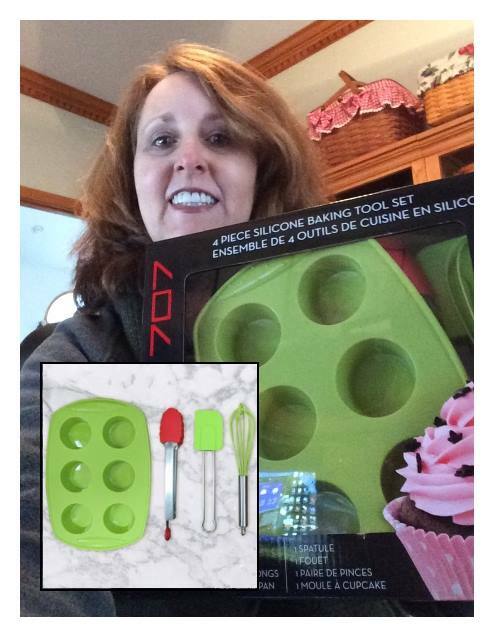 LOL)” – Connie E.
“ALL FOR A SPATULA: I won this Studio 707 4PC Silicone Cupcake/Muffin Tool Set for $3.40, a savings of $36.59 or 91%. I went after this for one crazy reason (LOL)…the spatula! I have one spatula like this one (only slimmer) and I love, love, love it. I’ve looked high and low and cannot find where these are sold separately although I can find them in sets with other items. Finally, I said, “What the heck. If I have to get a set, I have to get a set.” I wanted the spatula A LOT and I also thought the tongs would be nice to have. I’ve already used the spatula and, I can tell you, it lives up to expectations. So do the tongs. My son will get the muffin pan and, perhaps, the whisk. 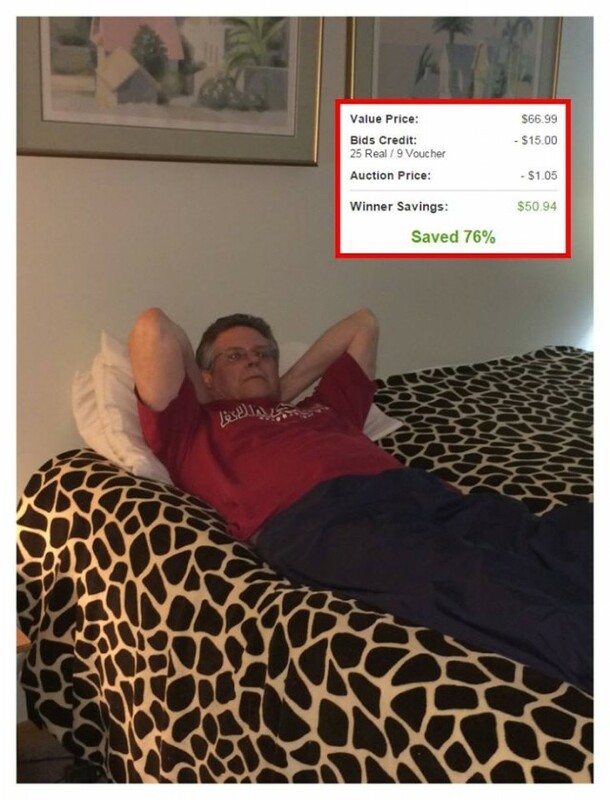 LOL Happy Bidding, everyone!” – Connie E.
“RESTING EASY: I could never get my sons or my husband to pose for me in the past but, last night, I finally got Jim to help. He’s laying on the King Size Lavish Home Fleece Blanket with Sherpa Backing that I won. As you can see, I chose the Giraffe pattern. I actually placed the blanket between my sheet and my comfort but, to show it, I had him try it out before I put the comfort on the bed. I went after this blanket because my sherpa throws I got on QuiBids are so toasty warm. I imagined that the big sherpa blanket would keep us warm in bed at night since it’s so cold in our house. I have the thermostat set to go down to 60 at night so we get cold. After just one night, I can tell you I was right. I normally have a different blanket between the sheet and the comforter and then we have a pile of throws on top because we can never get warm enough. With this blanket, I didn’t need the light blanket or any of the additional blankets I normally use. Jim actually got too warm and threw the comforter off on his side. So, if you’re looking for a VERY warm blanket for your bed, this is the ticket. This blanket was priced at $66.99. I used 9 vouchers and 25 real bids ($15.00) and paid $1.05. That means I saved $50.94 or 76%.” – Connie E.
“GREAT GIFT FOR A LITTLE GIRL: Well, I’m well ahead of schedule on my Christmas shopping. But, I couldn’t resist this Lush Décor Elephant Parade Sherpa Throw + 1x GP for a sweet little girl in my life. Her name is Ellie. She is 3 and this is an Elephant Throw. Last Christmas, I gave her the Happy Trails Rocking Ellie – The Stick Elephant. After all, it was named after her. I stayed with the Ellie the Elephant theme. I chose the Tangerine color for her blanket, but it’s also available on QuiBids in pink. I won this blanket using 10 voucher bids and paying just 61 cents. That’s a savings of $42.38 or 99%. I loved this gift idea not just because of the elephant theme but because it’s another of the wonderful sherpa throws. If you haven’t tried one yet, you really should. 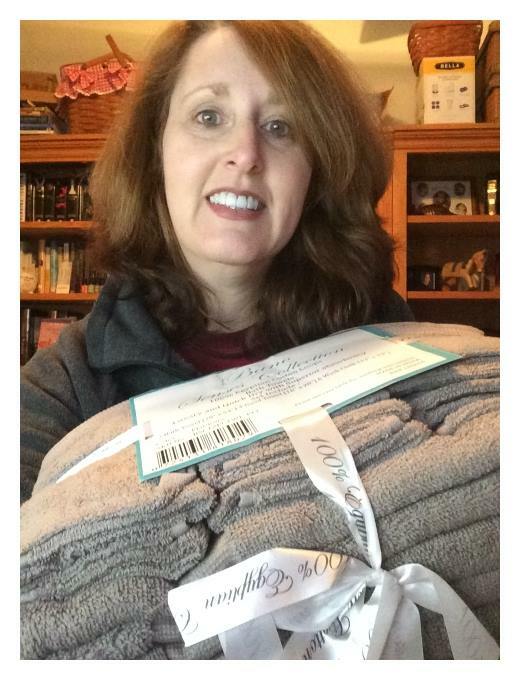 But, watch out for me, I still have one or two people left that I haven’t won these for.” – Connie E.
“COLLEGE BOUND: I won this 12 piece set of Bano Senses Egyptian Cotton 600 Gsm Towels for my son who will be headed to college in the fall. The set has 2 bath towels, 4 hand towels, and 6 washcloths. I let him choose the color and he chose platinum which is a very nice, almost taupe color. The towels have a nice soft feel to them. I’m sure he’s going to like them. This set is exactly what a kid going off to college needs. I used 12 vb and paid 66 cents for this great set. I just wish I had known about QuiBids when my first son went off to college.” – Connie E.
“THE GIFT OF GIVING: My friend, Robin, has been down on her luck for several years. She and her kids had to move in and live with her parents which no adult likes to have to do. But, things are looking up for her now. She has a new, better job. She now has hopes of getting a place for herself soon. But, she’s going to need just about everything. She was planning to go to garage sales to furnish her kitchen but I had a better idea. I decided to make furnishing her kitchen one of my QuiBids projects for the year. I was SOOO excited when I won this Cuisinart 55-11BK Advantage Nonstick Aluminum Cookware, 11-Piece Set for just $0.47 using just 10 vb. This set retails at $99.95 so I saved $99.48 or 99%. What a wonderful win. I did a happy dance for days. After it came, I couldn’t wait to give it to her. However, for the last two weeks, we couldn’t get our schedules to match so we could see each other. Finally, we were able to get together last night. It was a huge surprise. She didn’t know she was getting it. I was so excited I didn’t even let her get out of her coat before I sat her on the couch and presented it to her. LOL If there is anything more fun in life than giving a great surprise gift to a great friend, I don’t know what it is. I’ve been beaming ever since. It puts such joy in your heart that you really get the best gift yourself. I gave her two gifts last night. I’ll post the other soon. Thanks for giving me the means to do this, QuiBids! 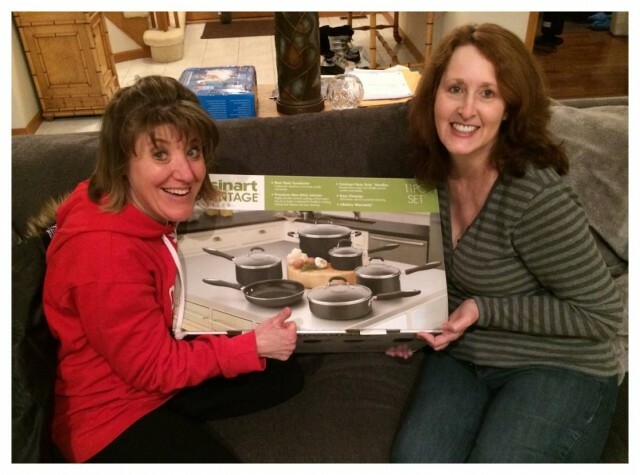 It feels so great, you have no idea.” – Connie E.
“THE GIFT OF GIVING (Part 2): I don’t usually post twice in one day but I posted earlier a gift of pots and pans I won for my friend, Robin, and I also wanted to post the second thing I was able to win for her. As I said, she’s going to need literally everything. So, the next item on my shopping agenda was a Geminis 8pc Silicone Green Utensil Set. The Geminis line is by BergHOFF so I know it is good quality. Plus, because it’s silicone, she can use it safely in her new pots and pans. I gave another set of these utensils as a gift at Christmas so I had already seen them and liked them. I don’t know why I chose green for her other than I just liked it. She said that she would have chosen green herself so it was just meant to be. Anyway, it was a hard-fought battle for this set. I used 53 voucher bids and paid $1.83. The set retails for $49.99 so I saved $48.16 or 96%. Still, a super deal. I gave the set to Robin right after I gave her the pots and pans. It was so much fun for me to see the excitement on her face. I think I’m getting addicted to surprise gifting. Thanks again, QuiBids for giving me the means to do this for my friend.” – Connie E.